Over the summer I bought this shadow box in hopes of it displaying all of my marathon goods…medal, time card, etc. Al painted it white for me and I tried so hard to fit everything into the box. Just wasn’t going to happen. So it’s been lying around waiting for a new purpose. 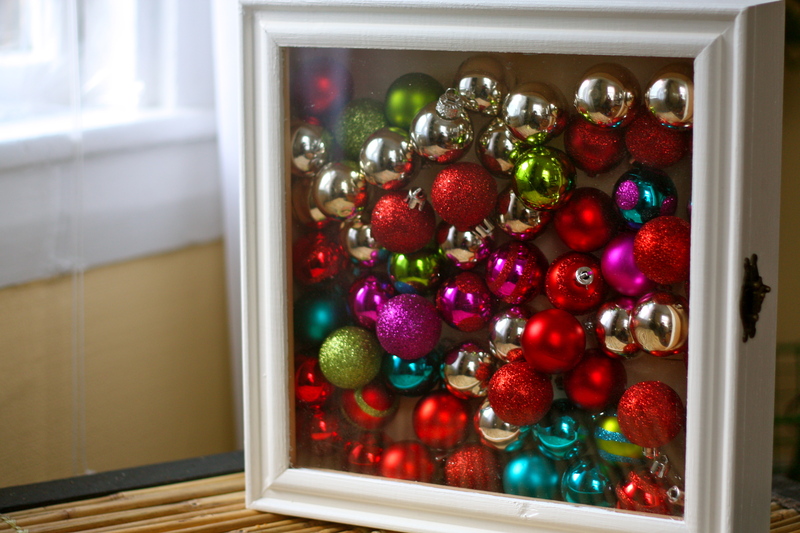 Using some of the Christmas tree ornament balls I already had I filled the shadow box. This was most likely the easiest project I’ve ever done. I made sure to fill it enough so that once it was closed they didn’t shift around. Closed the door of it and it’s ready to be hung on the wall. We even have the perfect spot for it to hang, this very tiny piece of wall in our living room that has nothing appealing on it. Though, I realized it doesn’t have any way to hang on the back so I have to run to the hardware store! I love the way it gives a pop of the holidays in the corner of the room. I might even plan to keep the shadow box there and switch out the contents for different seasons and holidays. How about you guys? 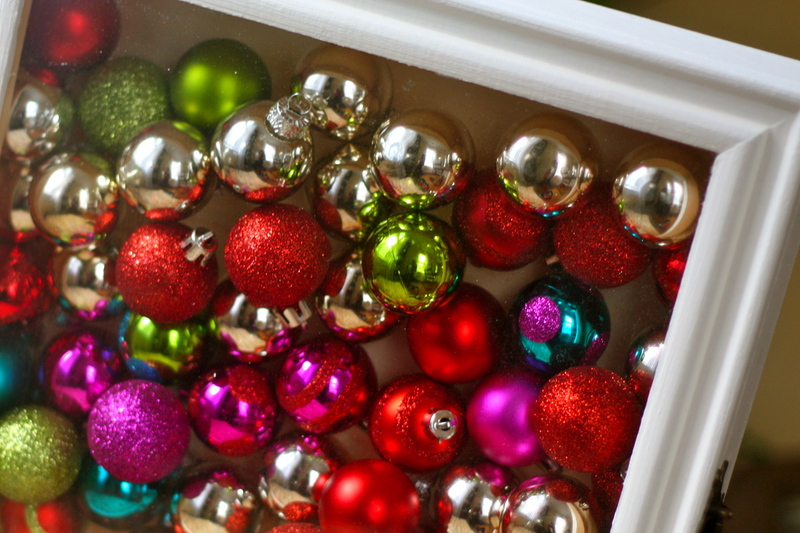 Any simple holiday decor pieces you’re making this year? Update: Here’s a final photo of the shadow box hanging on the wall in our living room. 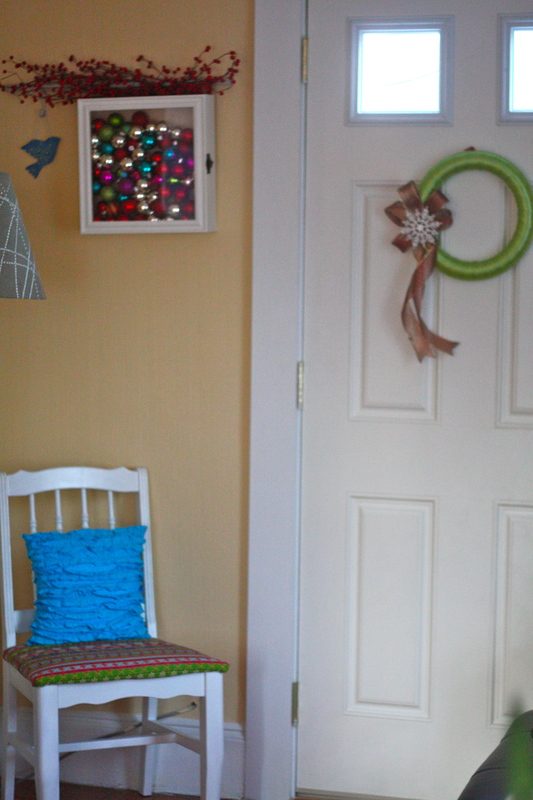 You also catch a glimpse of my simple, no stress holiday wreath too!